Hey Handsomites! Eric and Robbie are finishing their read through of Garth Ennis’ Punisher Max! They talk about the revelations in the last few arcs, Frank Castle’s origin in the Vietnam war, and the overall arc of the Ennis’ run! They also review a trio of new Marvel #1’s and Pretty Deadly #6! This entry was posted in Episodes and tagged batman: europa, garth ennis, goran parlov, howard chaykin, lan medina, leandro fernandez, ms. marvel, pretty deadly, punisher max, spider-woman, the mighty thor on November 24, 2015 by Robbie Dorman. Hey Handsomites! Eric and Robbie are discussing the middle arcs of Garth Ennis’ Punisher Max this week! They discuss the evolution of the villains, the wood chipper that is Frank Castle, and the revenge story as a genre! They also take a look at All-New All-Different Avengers #1 and The Goddamned #1, and discuss Fallout 4! This entry was posted in Episodes and tagged all new all different avengers, garth ennis, goran parlov, harrow county, leandro fernandez, punisher maxx, secret wars, the darkseid war:green lantern, the goddamned on November 17, 2015 by Robbie Dorman. Hey Handsomites! Eric and Robbie are talking the pulpy goodness of Starlight this week, by Mark Millar and Goran Parlov! They discuss the trappings of the genre, Parlov’s homage to Moebius, and how this compares to Millar’s other work. All of that plus reviews of Spider-Woman #5, All-New Hawkeye #1, and Blackcross #1! This entry was posted in Episodes and tagged all-new hawkeye, blackcross, goran parlov, green lantern, lobo, mark millar, spider-woman, starlight on March 9, 2015 by Robbie Dorman. Hey Handsomites! Another podcast filled to the brim of comic book goodness awaits! Eric and Robbie read the new Ms. Marvel, as well as Translucid #1 from BOOM! Eric tries his hand at the Bryan Lee O’ Malley Tweet Quiz once again, they delve deep into discussion about Nick Fury Max: My War Gone By, and talk about computers! What nerds, right? 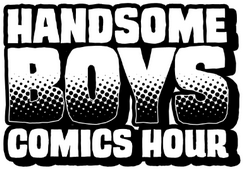 Take a look, it’s in this podcast, it’s Handsome Boys! This entry was posted in Episodes and tagged garth ennis, goran parlov, legend of korra, ms. marvel, my war gone by, nick fury max, red hood and the outlaws, sinestro, superior spider-man, translucid on April 22, 2014 by handsomeboyscomicshour.